It was cool sunny autumnal morning as the fleet convened at Manor House. Our trading destination today was the Bike Cave at northerly port of Driffield as suggested by Greybeard the Pirate. 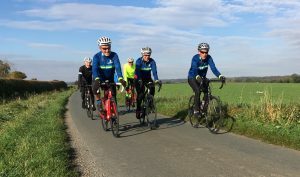 A cheery mood, inspired by the perfect riding conditions, was prevalent as the motley crew set off to rendezvous with “Davy” Jones at Cherry Burton. A gentle wind coming from the port quarter assisted our progress as we sailed into Etton. Heading along the main strait, a shout went up that our Rear Admiral Heather had suffered damage to her hull and had to be “careened” to effect repairs. Once suitably “caulked” and hull integrity restored, the fleet continued on passage towards South Dalton with Captain Pugwash setting the early pace. Passing along Mere Lane on a “broad tack”, Admiral Neil took up the lead until reaching the top of Bracken. Sensing a good photo opportunity, Greybeard seized his chance to jump onto the front as we navigated our way through the narrow passage created by a local waste disposal vessel. Putting on our best “Aaaargh Jim lad” grins we sailed in formation passed the Admiral, who recorded the moment for posterity. Greybeard relished his chance to dictate the pace, tacking our way along Burnbutts lane until passing (don’t mention) TJ’s. At Cranswick, we turned to then sail “before the wind” as we cruised along Meggison’s Turnpike and into Skerne. The fleet came to a brief stop outside Bell Mills Garden Centre, while the Admiral phoned ahead with our list of cargo requirements. Davey Jones saw this as a great chance to maintain his reputation and set off on his own to bag the first loading spot. While the fleet were berthing their vessels, the Admiral was spotted checking out the local “bazaar” and trying to tempt Long John Sliver (Russel) with fluorescent yellow cycle shoes to complement the rest of his colourful ensemble. A similarly brash pair of blue shoes was also bandied about as potential club kit. During the cargo loading, the “despatches” from each vessel were read out. A mention for one vessel, not in attendance, was raised regarding his transgression of the “rules of the road” concerning his comments on Slack. This led to the jocular suggestion that we should introduce a “yellow card” system. 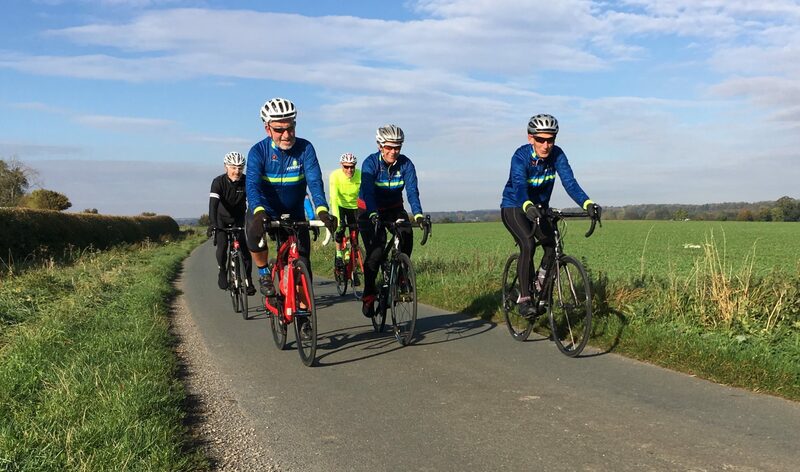 The return journey proved a more challenging effort as we sailed “close to the wind” while proceeding southwards towards Wansford and on to North Frodingham. The lead vessel changed frequently with Captain Pugwash, Captain Flint (Steve) and Long John Silver taking over from the Admiral. Davey Jones jumped onto the front after Wansford to set his own pace, while the rest followed astern in his wake. On the road into Brandesburton, Rear Admiral Heather and Captain Elizabeth Swann (Sharrin) took up the “cudgels” to lead the fleet onwards. Despite the adverse head winds, good progress was made and we soon reached Leven and onto the cycle path back towards Tickton where everyone headed back to their home ports.